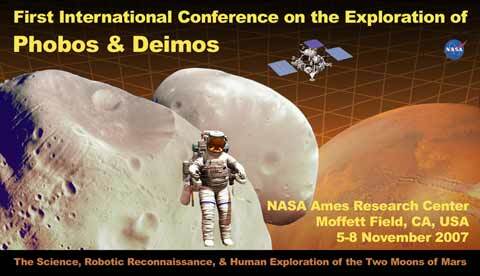 Human exploration of Phobos and Deimos? How kewl is this? The Lunar and Planetary Institute and several other sponsors are holding a conference on The Exploration of Phobos and Deimos, the moons of Mars. Well, sure, that's cool. But what makes this kewl is the subtitle: "The Science, Robotic Reconnaissance, & the Human Exploration of the Two Moons of Mars". Yeah, you read that right: Human Exploration. It makes sense. We're building bigger rockets to go to the Moon and Mars. When you get to Mars, you have to go into orbit anyway. If the orbit is the same height above the surface as one of the two moons, then by the laws of physics you're moving at the same speed as the moon around Mars anyway. Rendezvous is easy. But it's also easier going to the surface of the moon from there than it is to get down to the surface of Mars! To touch down on the red planet, you need retrorockets, parachutes, maybe an airbag or two, because Mars has serious gravity and an atmosphere. But the moons are airless, and have very little gravity. A small retrorocket is all you need to get down. It's thought (and it's really pretty certain) that Phobos and Deimos are captured asteroids, so this is an excellent chance to see an asteroid up close. We can get to near-Earth asteroids more easily, but if we're exploring Mars anyway, this is almost a freebie. There was a show on the Discovery Channel a few years ago about the moons in the solar system, and my old friend Dan Durda was being interviewed. They showed him mimicking what it would be like to be on the surface of Phobos. He said you could pick up a rock and throw it into orbit around the little moon. He's right, and maybe, just maybe, by 2030 or so we'll see that actually happening. I'm of two minds about sending humans to Mars (the moon is closer, easier, and I think has more to offer in the immediate future), but I will not and cannot deny the kewl factor.